Swimming pools designs have come a long way from the classic rectangular pool shape. These days, pools can be built in a wide range of shapes, sizes, and styles. Modern pools tend to have eye-catching tiles, water features, and other elements to create a more enhanced ambiance. At Summerhill Pools, our team of pool builders is familiar with the latest trends in swimming pools for Dallas homeowners. We can help you design a high-end pool with features that make it as fun to look at as it is to swim in. Get in touch and let’s start planning your way to the breath-taking modern pool designs. Modern pools can have a number of features for aesthetic or convenience purposes. Some potential features to add to your modern pool include tanning ledges, swim-up bars, and gently sloping beach entries. Certain finishes can provide modern pools with a memorable look, while water features, such as bubblers and deck jets, can give these pools a more artistic appearance. At Summerhill Pools, our team of professionals knows how overwhelmed you might feel by the sheer amount of options and features that are available for your modern pool. We’ll provide you with options that can enhance your pool overall while also taking any pool design ideas you have into account, and do our best to make the design process go more smoothly for you. We look forward to helping you create an ultra-modern pool that lasts (and stays in style) for years. A subset of modern pools is geometric pools, which typically feature pronounced angles or curves and elaborate or irregular shapes. Geometric pools can be symmetrical, which offers a more streamlined look, or asymmetrical with angles or curves at various intervals. Asymmetrical geometric designs create a more visually stunning effect. The experts at Summerhill Pools have the training and experience needed for designing and building geometric pools in many different styles. We offer custom designs for geometric pools so that you can create the exact design you have in mind. Our pool builders will help you determine if your design fits the layout of your yard or if we need to make adjustments. When you’re looking for a pool that is both more stylish and more elegant than traditional pools, contemporary pools are an excellent choice. Styles are constantly changing, but here at Summerhill Pools, we’re always up-to-date with the latest pool design trends so that we can provide you with the best options for your contemporary pool. Whether you want a pool with a strong ornamental design just for looks or a pool that offers luxurious amenities and features, we’re here to help. Our team will walk you through the pool design process to ensure that you get the contemporary pool that best suits your property. 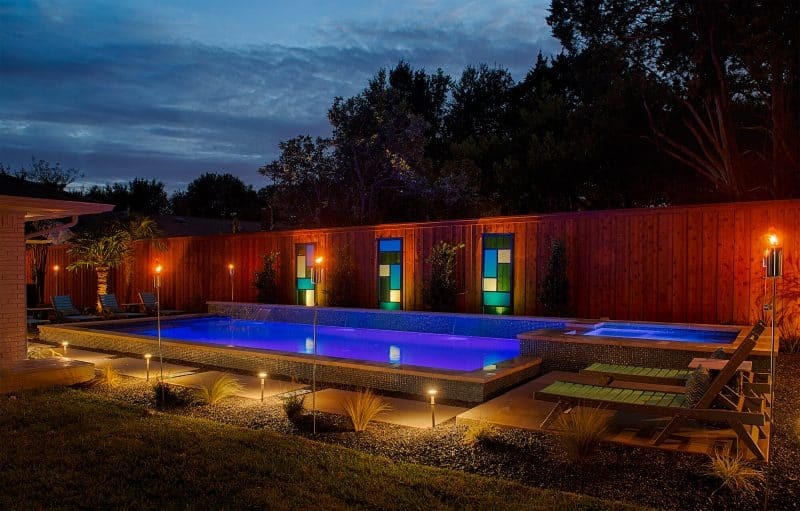 Give us a call if you want to learn more about our contemporary pool design and installation services in the Dallas area. Trusting your pool design and installation to the top pool builders in Dallas means that you will get the exact modern swimming pool that you’ve been envisioning. 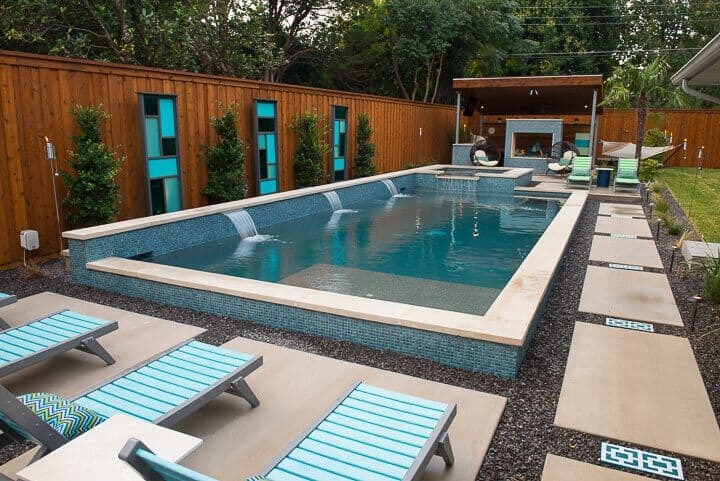 At Summerhill Pools, we offer superior quality modern/contemporary swimming pool design and installation for homeowners in the Dallas metroplex area. Our team has the right knowledge to help you create a stunning modern or contemporary swimming pool that fits your needs while also incorporating your design preferences. Whether you’re interested in a pool that has a striking appearance and memorable features or a pool that offers a calm and relaxing swimming experience, our pool experts will design and build you the pool of your dreams. After designing your modern pool, our team will get to work on bringing that vision to life using high-quality materials, equipment, and tools. No matter how complex your contemporary pool design is, our builders can handle it with expert precision and attention to detail. When construction is finished, you and your family will have an impressive swimming pool that can withstand high temperatures, severe storms, and other environmental factors living in North Texas. Contact us and let’s get started with a plan for your new pool!